With no games from EuroLeague Women Group A and Lattes-Montpellier losing, there was not much French interest in the ELW this week. Sonja Petrovic lit up the round with her best match of the season while five teams have picked up their play-off ticket. Veuillez trouver des informations en français en bas de la page sur la douzième journée à l'Euroligue féminine. Sonja Petrovic was on fire, just missing two shots while scoring 28 points, pulling down 8 rebounds, getting 6 steals and dishing out 5 assists for Sparta&K MR Vidnoje in their EuroLeague Women victory against Kibirkstis-VICI (97-56). 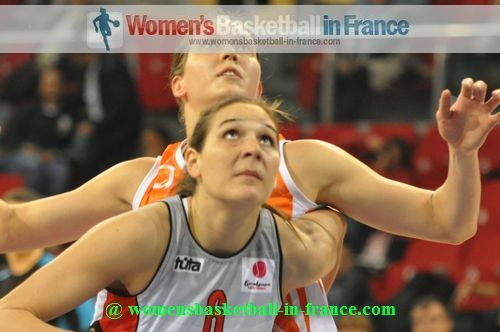 Natalia Vieru was also in good form picking up 12 rebounds and scoring 17 points in backing up Petrovic. With this victory Sparta&K MR Vidnoje are sure of a place in the second round. In the other games from EuroLeague Women Group C ZVVZ USK Prague rolled over CCC Polkowice (63-46) while Perfumerías Avenida overcame their road phobia to beat the already eliminated WBC Novi Zagreb (77-76). Shay Murphy and Leonor Rodriguez knocked down 14 points each for the Spanish champions who join Galatasaray Odeabank (who did not play) in the play-offs. Lattes-Montpellier failed to make an impact in Fenerbahçe and lost (50-78). Fenerbahçe who had seven players scoring at least 9 points are already Group B winners. 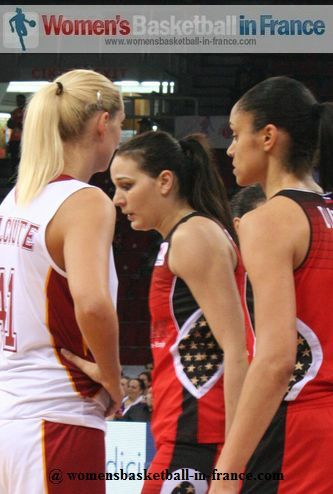 They are the only team in the EuroLeague Women competition with a 100% record. Géraldine Robert and Gunta Basko-Melnbarde provided most of the fire power for Montpellier with 16 and 12 points respectively. Lattes-Montpellier's fate in this competition may be decided next week after playing Sopron. Rivas Ecópolis ran away from their hosts BK IMOS Brno during the second half of the match 42-27 to win the encounter (89-68). Laura Nicolls was the most active player with 18 points and 9 rebounds. Rivas need a single victory from the remaining games to qualify for the play-off round. Nadezhda Orenburg rebounded from last week's defeat with a road win against UE Sopron (52-70) and a place in the play-offs. Dewanna Bonner, Anna Cruz and Natalia Anoikina scored 18, 15 and 14 points respectively for the winners. With Sopron, Montpellier and Brno losing, Wisla Can-Pack has automatically qualified for the play-offs. Lattes-Montpellier a encore une chance de se qualifier après sa défaite de la 12ème journée pendant que Nadezhda Orenburg, Perfumerías Avenida et Sparta&K MR Vidnoje se qualifient pour les play-offs pendant que Wisla Can-Pack participe aussi aux 1/8 de finale sans avoir joué. Ce sont Géraldine Robert (16 points) et Gunta Basko-Melnbarde (12 points) qui portent haut les couleurs pour Lattes-Montpellier dans une rencontre dominée par Fenerbahçe dont le club turc remporte facilement ce match (78-50). Le club espagnol, Perfumerías Avenida, s'impose contre WBC Novi Zagreb (77-76) et joint ainsi Galatasaray Odeabank dans les play-offs. Shay Murphy and Leonor Rodriguez contribuent 14 points chacune à la victoire. C'est grace à une Sonja Petrovic parfaite (28 points, 8 rebonds, 6 interceptions et 5 passes décisives) que Sparta&K MR Vidnoje domine Kibirkstis-VICI (97-56) et se qualifie également pour les 1/8 de finale. Rivas Ecópolis gagne à BK IMOS Brno (89-68). Laura Nicolls marque 18 points et 9 rebonds pour Rivas qui pourrait encore se qualifer en gagnant une des deux rencontres. Le dernier match de cette journée est gagné par ZVVZ USK Prague (63-46), déjà qualifié, contre CCC Polkowice.